Semi-industrial carbide tipped blades feature Dyanite® Carbide teeth that are constructed of a unique blend of tungsten carbide and boron to ensure the teeth hold a sharp edge that lasts five times longer than standard carbide. A fully hardened blade adds stability and eliminates distortion and bending. Specially designed for cutting nonferrous metals such as aluminum, copper, brass and lead. 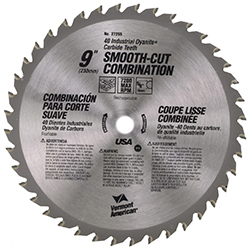 May also be used for general purpose crosscutting and trimming in all hard woods, double-faced laminates, plastics and veneers.